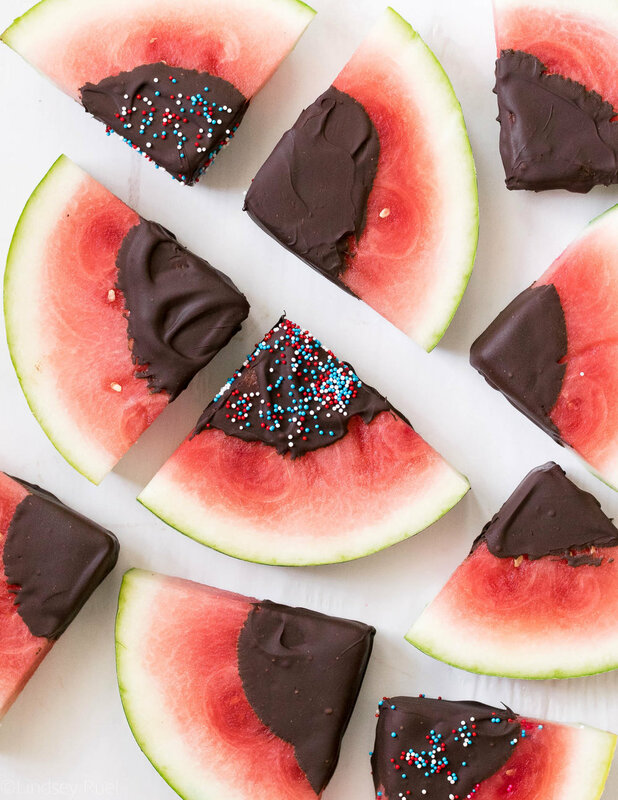 If you are looking for a super easy, somewhat healthy, all around people-pleasing dessert for any Summer party or picnic, then you have to make yourself some chocolate dipped watermelon! The first thing to do is to cut the watermelon into slices. These can be as big or small as you like. They don't even have to be slices! They can be chunks or sticks or however you like to cut your watermelon. Lay the slices of watermelon on a tray and let them chill in the fridge while you move onto the chocolate. The trick to getting a nice chocolate coating that sticks to the watermelon is to temper the chocolate. Tempering chocolate used to intimidate me, but it's actually pretty easy and makes a world of difference! Instead of chalky, grainy chocolate, you will have a nice smooth, glossy chocolate coating. To temper the chocolate you first melt about 2/3rds of the chocolate over a double boiler. Not all the pieces will be melted, but most should be starting to melt. Then stir the chocolate off the heat until all the pieces are melted. At this point, the chocolate should be pretty hot. Then add in the rest of the chocolate pieces and mix until they have melted into the rest of the chocolate. This may take a while because the chocolate is cooling down as more chocolate is added. By the end, all of the chocolate pieces should be melted and the chocolate should actually feel cool to the touch. I highly recommend checking out this very in-depth post about how to temper chocolate. Next, just dip the watermelon into the chocolate. If the watermelon has developed a lot of moisture on the surface, blot that away with a paper towel before dipping. It will ensure that the chocolate sticks. If you want the chocolate to cover even more of the watermelon, use a spoon or spatula to spread it up the sides. Because the watermelon is cold from the fridge, the chocolate will start to harden pretty quickly (which I actually prefer). So if you want to add any toppings, act fast! 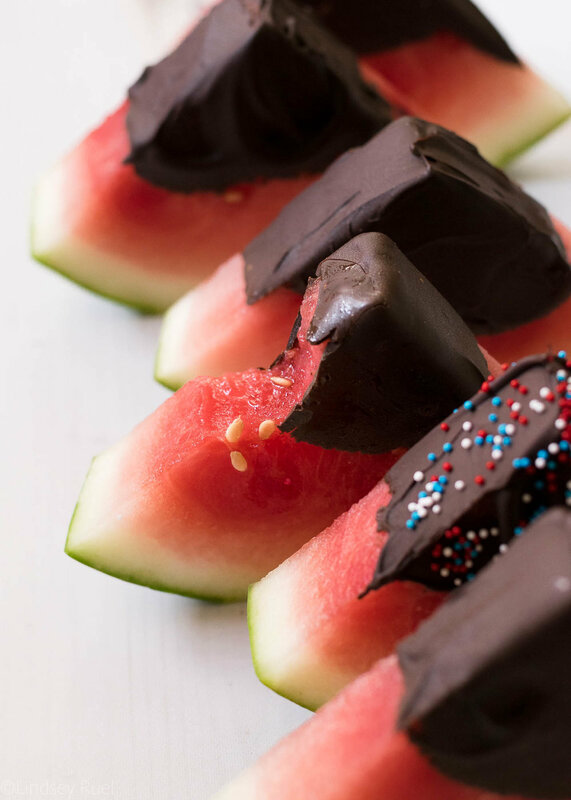 You can add sprinkles to make these chocolate dipped watermelon slices super festive. You can even sprinkle on some sea salt or chopped nuts. Go crazy! Whichever way you dress up your watermelon, I guarantee it will be delicious and refreshing! A perfect combination for a hot Summer day! Place the watermelon slices in the fridge to chill. Bring a small sauce pan of water to a simmer. Turn off heat then place a metal bowl large enough to sit on top of the sauce pan easily. Pour 2/3rds of the chocolate into the bowl and let sit for 2-3 minutes. Remove the bowl from the sauce pan and stir to combine all the chocolate. Stir until all pieces of chocolate are melted. The chocolate should be hot to the touch. Pour in the rest of the chocolate. Stir to melt the newly added chocolate. This may take 5-10 minutes. Once all the chocolate is melted, test the temperature. The chocolate should feel cool. If not, add more chocolate and continue stirring. One at a time, dip the watermelon slices into the chocolate. If the chocolate does not stick to the watermelon, blot the excess moisture from the surface of the watermelon to ensure that the chocolate sticks. Immediately add any toppings. Let the chocolate harden completely before serving or storing.